Approximately 5600 people are diagnosed with primary liver cancer each year. It is a rare cancer in the UK and it is much more common to have cancer that has spread to the liver from from somewhere else in the body. This is called a secondary liver cancer. 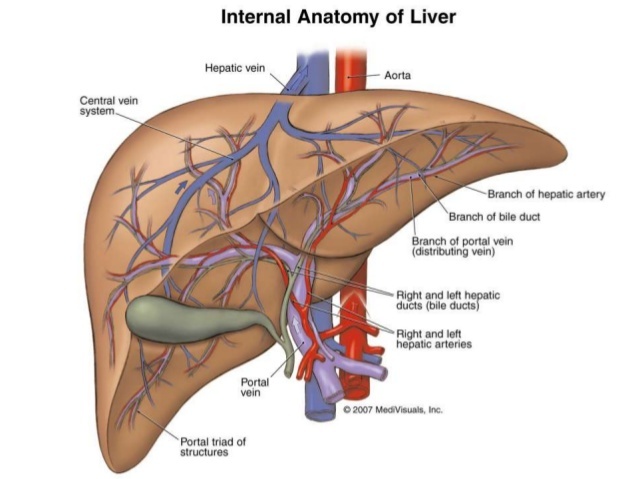 The liver is made up of different types of cells. The type of liver cancer depends on where it starts and the type of cell it starts in. The most common type of liver cancer is the hepatocellular carcinoma (HCC). Other types include fibrolamellar cancer (rare type of HCC), intra hepatic cholangiocarcinoma, angiosarcoma and hepatoblastoma (usually affects young children). The size, type and grade of liver cancer can affect survival. Genrally, for adults diagnosed with liver cancer in the UK approximately 35% survive their cancer for 1 year or more and 10% will survive their cancer for 5 years or more after they are diagnosed. The main treatments are surgery to remove the cancer, liver transplant, biological therapy and chemotherapy. The bile ducts are part of the digestive system and are tubes that connect the liver and gallbladder to the small duct. They carry bile. Bile duct cancer is usually called cholangiocarcioma. In the UK around 1900 people are diagnosed each year with intrahepatic bile duct cancer and around 530 people are diagnosed with extrahepatic bile duct cancer. The type of bile duct cancer depends on which part of the bile duct the cancer starts in. The two main types are cancers that start in the bile duct outside the liver (extrahepatic bile duct cancers) and cancers that start in the bile ducts inside the liver (intrahepatic bile duct cancers). There are two types of extrahepatic bile duct cancers perihilar region bile duct cancers and distal region bile duct cancers. Perihilar region bile duct cancers are cancers that develop just outside the liver, where the left and right hepatic ducts join together. These are called Klatskin tumours or hilar cancers and are the most common type. 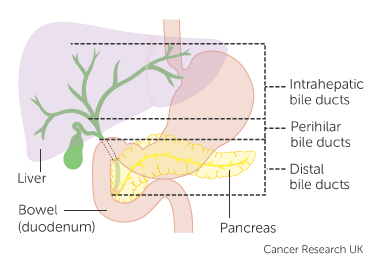 Distal region bile duct cancers are cancers that start in the bile ducts below the perihilar region near the bowel. Intrahepatic bile ducts cancers start inside the liver. There are a number of small bile ducts that join together inside the liver to form the left and right hepatic ducts. Around 20% of bule duct cancers start in the intrahepatic bile ducts. One of the main treatments for bile duct cancer is surgery. After surgery patients may have radiotherapy or chemotherapy or both. There are no UK wide statistics available for bile duct cancers. The Public Health England's National Cancer Intelligence Network (NCIN) give the following statistics and are for people diagnosed with bilary tract cancer. For those diagnosed in England in 2012 almost 30% of men and 25% of women survived therir cancer for 1 year or more after diagnosis. For those diagnosed in England in 2008, more than 5% of men and around 5% of women survived their cancer for 5 years of more after they were diagnosed. The table below lists the current open trials for liver and bile duct cancers coordinated by the Cambridge Cancer Trials Centre (last updated February 2018).